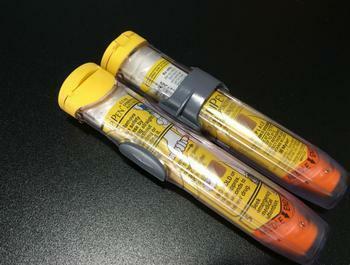 Already facing a recall of its EpiPen auto-injectors because of a faulty part, Mylan Pharmaceuticals now has been hit with a class-action lawsuit that accuses the company of engaing in an illegal organized scheme to systematically increase EpiPen prices by 574 percent. The lawsuit alleges that since Mylan acquired the rights to market and distribute the EpiPen in 2007, it has increased the list price 17 times, from $90.28 to $608.62, causing some patients to resort to carrying expired EpiPens, or to using syringes to manually inject epinephrine, the drug that helps counteract severe allergic reactions. According to the complaint, this once-affordable drug that has been available for more than 100 years and costs pennies to produce is now out of reach for many patients due to a behind-the-scenes quid pro quo arrangement between Mylan and other players, designed to increase profits and guarantee Mylan’s EpiPen is chosen by insurance companies for use over its competitor’s alternatives. “Mylan has tried every trick in the book to avoid taking accountability to the millions of people who are living without the EpiPen they need to prevent a life-threatening allergic reaction. Despite the fiction that Mylan has tried to sell the public, and sell Congress, the numbers don’t lie – Mylan has been the motivating force behind the jaw-dropping 574 percent EpiPen price hike,” said Steve Berman, managing partner of Hagens Berman, the law firm that represents the patients. According to the lawsuit, Mylan has exploited the drug-pricing system in a way that ensures it higher profits while leaving those living with allergies who need EpiPens crippled by high costs. These acts, says the lawsuit, constitute a RICO enterprise, and violate the Racketeer Influenced and Corrupt Organizations Act and various state consumer protection laws. These middlemen negotiate prices with drug manufacturers on behalf of health plans. “Together, the three biggest PBMs—Express Scripts, CVS Health, and OptumRx—bring in more than $200 billion a year in revenue. They also control over 80% of the PBM market, covering 180 million insured people,” the suit states. The larger the spread, the higher the PBMs’ profits, and the higher likelihood PBMs will choose a certain drug company’s product to receive a favorable formulary position, and be prescribed more often. Neither the drug companies nor the PBMs disclose the rebates given to PBMs to secure formulary placement, labeling them as trade secrets. When list prices for EpiPen were increasing most dramatically, some companies tried to introduce auto-injectors to compete with EpiPen, according to the suit, but those competitors never succeeded in displacing EpiPen’s market dominance because they did not pay the rebates Mylan paid the PBMs. Adrenaclick, one auto-injector, had a list price one-third of EpiPen’s, but was withdrawn from the market because PBMs did not place the drug on formularies. Auvi-Q, another auto-injector, attempted to match Mylan’s list prices but, every time it did, Mylan matched the increase, and, as a result, Auvi-Q fought for months to get the favorable formulary position that EpiPen had before it was withdrawn from the market for other reasons.